Our product range includes a wide range of beaded net fabrics. The extensive usage of beaded net fabrics can be well seen in this embroidered wedding gowns in tulle thus making it look extremely fragile and elegant. 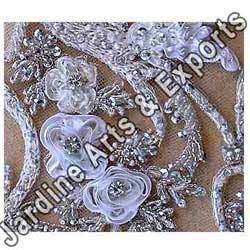 The tulle has been used to make roses that are placed in the gown and fine embroidery with the help of silver colored beads and thread is done on superior quality net. The design is intricate and has beautiful blue beads placed in between thus adding a dash of color and vibrancy. Looking for Beaded Net Fabrics ?